It took me a while to really appreciate the venous sinuses. The protocol I was taught was overly complex with lots of difficult handholds – it put me off for years to be honest. Last year I was teaching about the blood flow from the head and I came across a wonderful image in Theime of the jugular veins – the top left image is my attempt to generate a similar view. The image gave me another way into the venous sinuses. 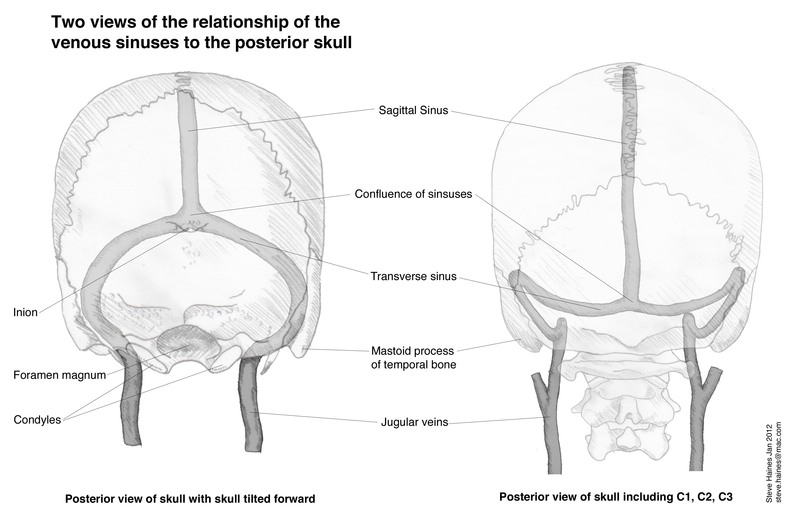 By focusing on differences in flow between the left and right jugular veins, and only really orienting to the sinuses shown above, I found I have much clearer experiences of blood leaving the skull. It is a good orientation and really seems to help people drop into a deep space. I hope it works for you. gud morning sir thanks for your meaningful and educative email,i helps a lot to learn more about cranial sacral therapy. thanks and kind regards. kulbir. I am getting ready to teach the VS Drainage to my class and this is so helpful. I also have found the protical from Franklin way too complicated. Can’t wait to study with you in Toronto.